You love your clothes just as much as you love scent - so keep them invigoratingly fresh with Downy Infusions Botanical Mist Fabric Conditioner. This fabric softener infuses clothes with a touch-activated misty fragrance of crisp apple and earthy flowers, all while conditioning and protecting them from stretching, fading, and fuzz. 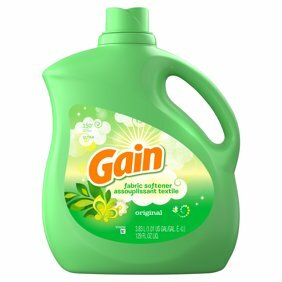 Use every laundry day to make your clothes smell as great as they look and feel. Liquid fabric softener can increase fabric flammability. Using more than recommended can increase this effect. Do not use this product: on children's sleepwear or garments labeled as flame resistant as it may reduce flame resistance; on garments made with fluffier fabrics (such as fleece, velour, chenille, and terry cloth). Ingredients: Ingredients Include Biodegradable Fabric Softening Agents (Cationic). Instructions: Store at room temperature. Measure: 1. Medium. 2. HE Large Loads. 3. HE full loads. Shake it! Then, pour to desired line. with Downy vs. detergent alone after 15 washes. Pour: Pour your desired amount into dispenser. For center agitator, top off with water. Experience: 6 Benefits in Every Drop: Long lasting freshness; Helps reduce wrinkles; Less fuzz & pills; Superior softness; Keeps colors bright; Helps prevent static. Our Fabric Conditioners are designed to control static, keep clothes looking newer for a longer period of time down to the fiber of clothes, so we're glad you noticed the difference. And we're so glad that you are pleased with the results! Thank you for giving Downy a chance. We're delighted to hear that you are pleased with the results in the last 2 weeks of using our Fabric Conditioner! A scent you won't forget!